When I stepped out of the cab, the sounds and sights of Madrid immediately descended upon me. Sunlight filtered through trees onto dark cobblestone streets. Pink and yellow terraced buildings adorned with plants seemed to lean into one another as if they were old friends, their façades occasionally broken by clothes hanging from washing lines. The giggling of children in a playground speckled with graffiti and chalk markings mingled with the chirping of birds and the chit chat of neighbors from across their balconies. Within minutes of arriving in Madrid, I felt enamored of the unique city. As a student studying Spanish, hearing Spanish all around me felt like a homecoming of sorts. I was eager to immerse myself in a country I had wanted to visit my entire life. During our first night in Madrid, we enjoyed various tapas, such as croquetas and montaditos, for dinner. We left the restaurant at around 11:30pm, but the city appeared to have just woken from a deep slumber. We got lost in the winding streets of Madrid while following the sounds of live music and the happy hum of friends gathering to enjoy a cerveza at their favorite bar. The following day began leisurely with good coffee and pastries at Pum Pum Café. A nice stroll afterwards took us to central Madrid. The magnificence of the Prado Museum cannot be missed. Its looming skylights seemed to cast the museum’s beautiful artwork in an ethereal glow. We also visited the Reina Sofía, where we were lucky enough to see Picasso’s Guernica. 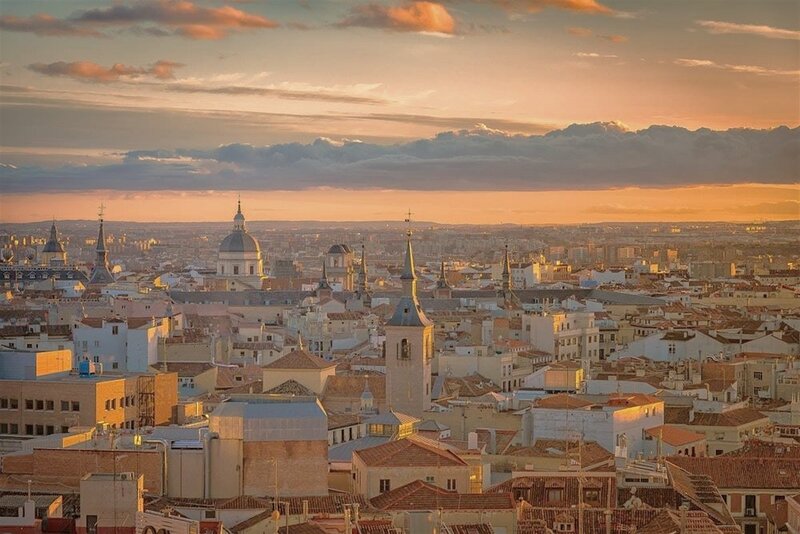 Madrid is a city rich in art and history, both old and new. Its grand museums provide an interesting contrast to the modern, and often political, street art one can find on any street corner. 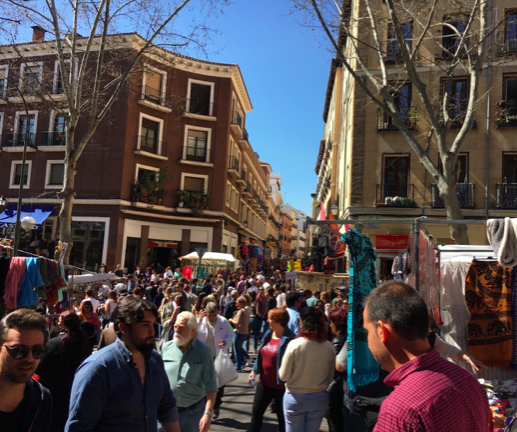 On our last day in Madrid we visited the popular flea market, El Rastro. The market seemed to stretch endlessly with its hundreds of stalls. The streets were buzzing with vendors selling everything from shoes made from bamboo to hand-painted dishes found in the Spanish countryside. The bustle of tourists and locals alike in the market captured the vibrant energy of Madrid. Staying in Madrid for just a few days was an incredibly enriching experience. 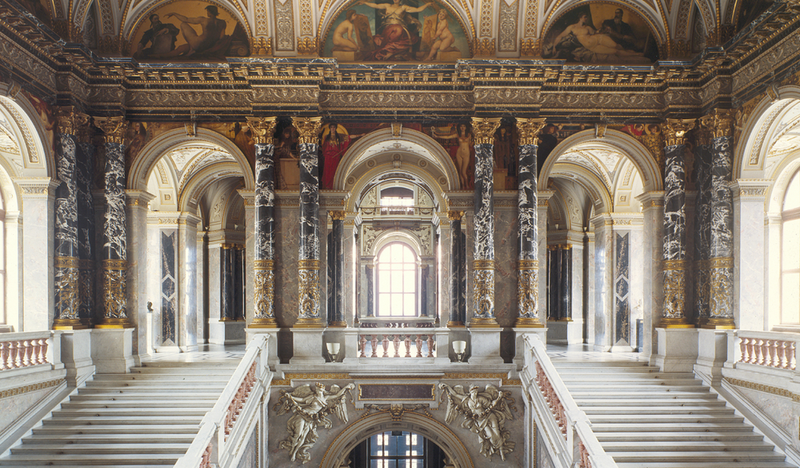 The beautiful architecture, delicious food, and rich culture were all entrancing. If you ever find yourself in Madrid, grab some tapas, visit a few museums, and soak up everything this magical city has to offer. Travel Tuesday: Next Stop, Norway!